Structure elucidation of glycans/carbohydrates is an essential prerequisite for understanding the roles of carbohydrates in various biological pathways. However, carbohydrates are an extremely complex group of isomeric molecules owing to variations in their monomer stereochemistries, inter-residue linkage positions, and branching patterns, leading to a formidable challenge for analytical chemistry. The primary goal of a collaborative project with Dr. Herb Hill’s group (WSU Chemistry) is to develop methods based on ion mobility spectrometry (IMS) and mass spectrometry (MS) for glycomics detection and structure analysis (isomer differentiation and characterization), with a focus on high resolution analytical separation techniques coupled to different types of mass spectrometry. IMS is a unique gas phase ion separation technique based on the ion’s collision cross section area (Ω) and charge, which makes it an ideal tool for isomer, isobar, conformer differentiation for molecules having identical m/z values but different structures or configurations/conformations. 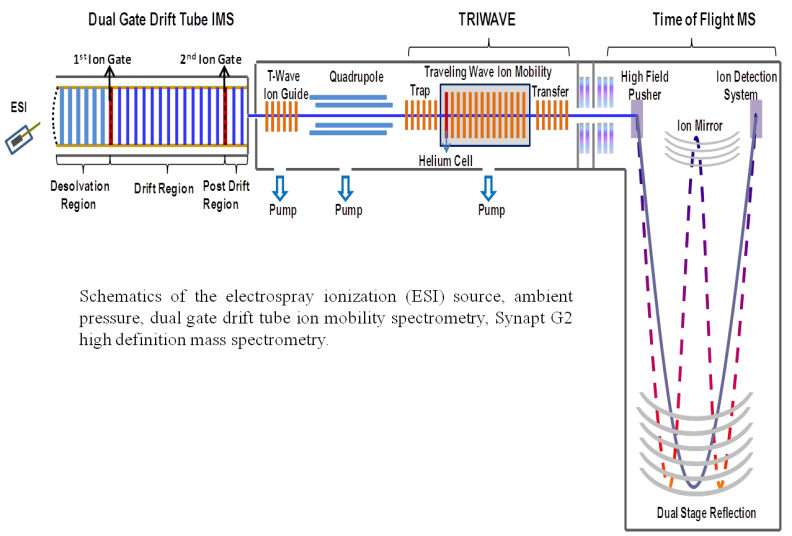 We have successfully interfaced a house-built dual gate IMS to a Synapt G2 high definition MS: hybrid quadrupole-tandem MS-traveling wave ion mobility-time of flight MS. The figure below shows the overall schematics. Dual gate drift tube ion mobility spectrometry can be used to acquire traditional mobility spectra and is also able to select compounds within specific drift time windows. This new hybrid instrument combines DTIMS and TWIMS, mass selection and mobility selection all together for the first time. It also incorporates both MS and tandem MS analysis capabilities. Ions of interest can be mobility selected from a mixture, transferred through the interface and then mass filtered for further fragmentation and TWIMS analysis. This instrument has been demonstrated to be a valuable tool with special added advantages for isomeric carbohydrate structure characterization when such compounds are in a mixture and could serve as a promising technique for many other types of isomers, compounds or biological samples as well.